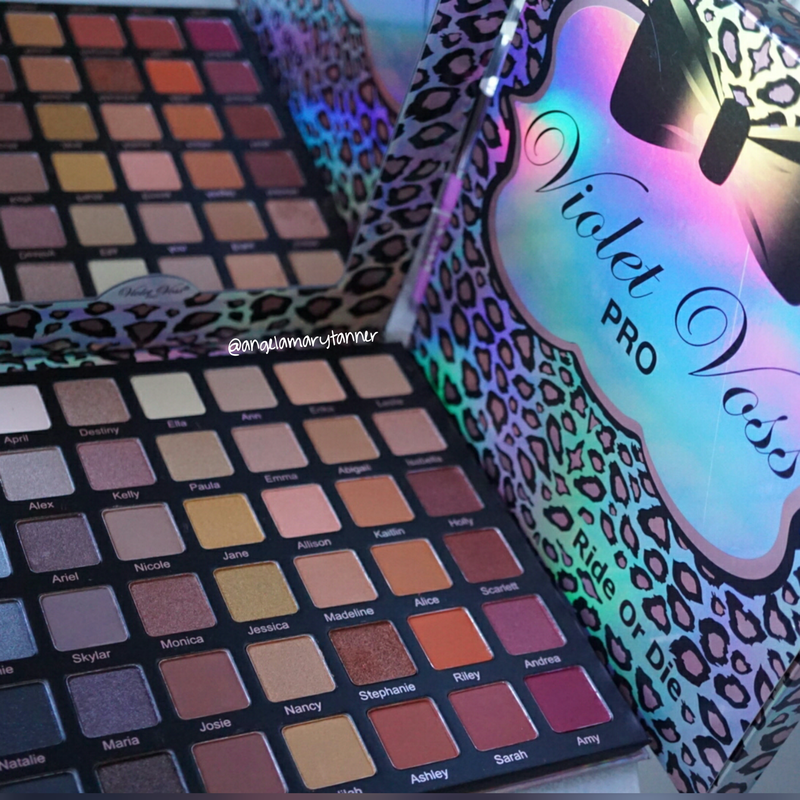 This palette was sent to me but we’re not otherwise affiliated with Violet Voss. 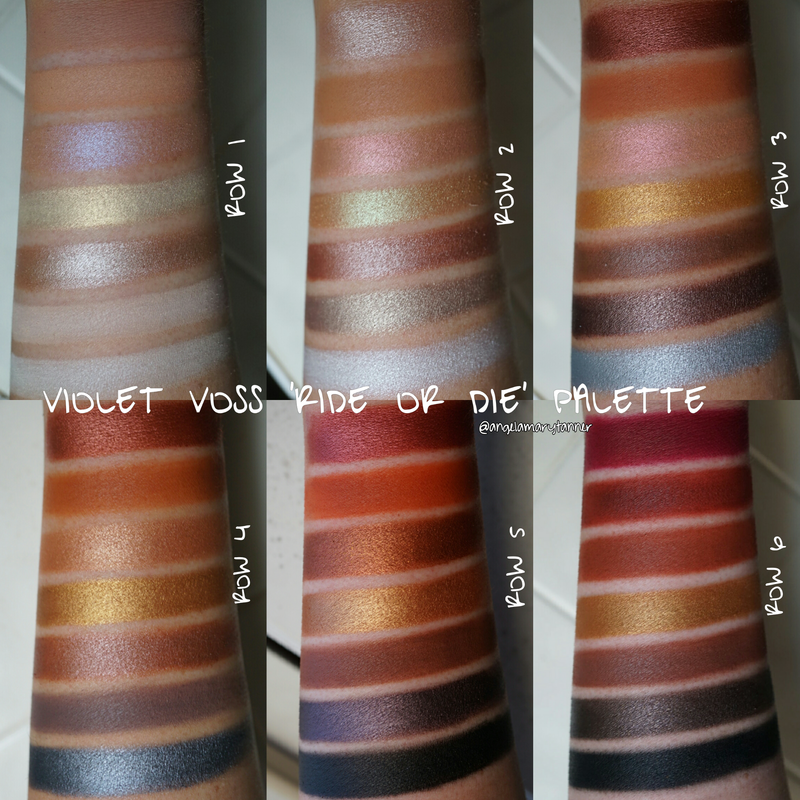 After months of teasers, Violet Voss finally released their highly anticipated RIDE OR DIE PALETTE. It is a little spendy at $75 but there is a discount code that you can use to knock down the price by 10%: RIDEORDIE10 This palette is so friggin huge that I don’t even know where to start to be honest. So I guess I’ll get the deets out of the way and then we’ll talk colors and formula. It’s a large, slim cardboard palette with a holographic leopard pattern and a huge mirror You’re getting 42 full sized (1.6g) eyeshadows. The ingredient deck looks decent to my completely novice eyes (aka no mineral oil or parabens which seems to be the two things most commonly avoided) but it is made in PRC (People’s Republic of China). The palette is currently sold out but they’re shooting for a restock on March 7th. But since I love you guys, I decided to do these swatches in columns as well so that you can see the color families side by side. 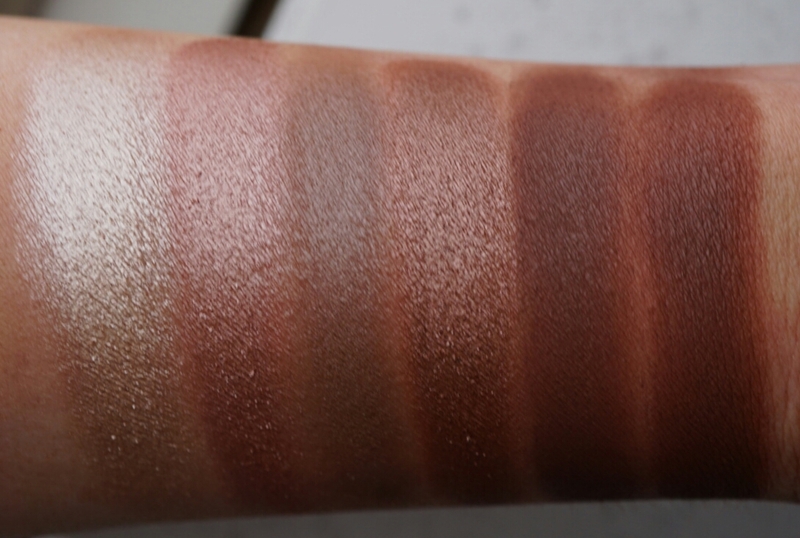 Although a lot of the shades are definitely similar, they’re not exactly the same and they were chosen with purpose (in my opinion). I’m working backwards here for some reason. So we’re going right to left. 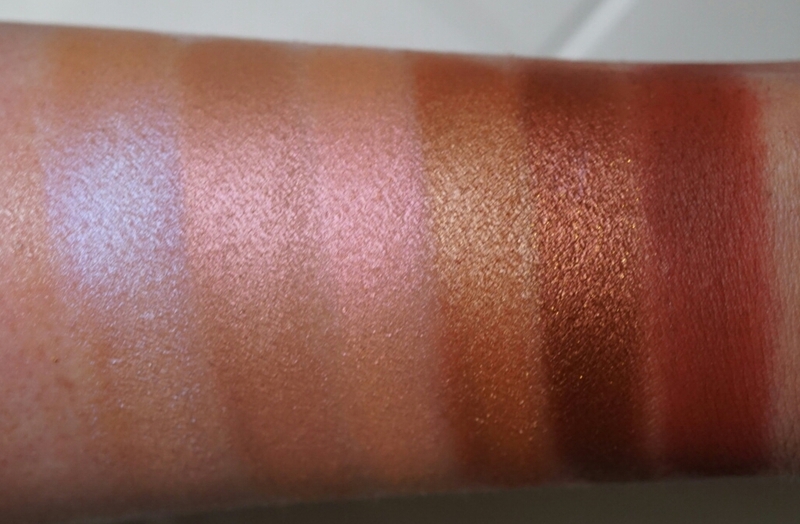 I’m going to go through each shade briefly and give you my thoughts on this palette as we go! This column is very ‘holy grail-esque’. LESLIE is a light beige matte, very similar to my skin tone. ISABELLA is a dense peachy champagne with an ultra metallic finish. HOLLY is a deep brown with very strong red undertones and a foiled finish. SCARLET is similar to HOLLY but lighter and more copper. ANDREA is a medium cranberry, also metallic. 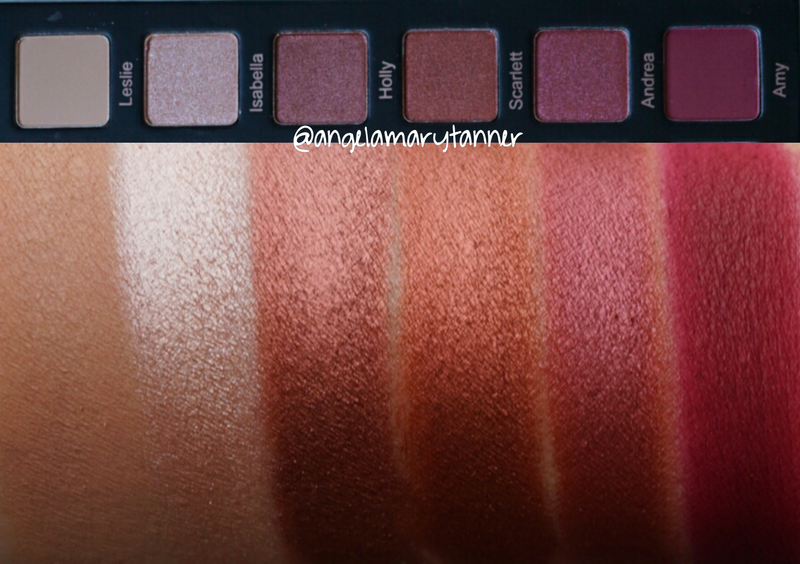 AMY is a deep wine matte, very similar to WINE N DINE from the HG palette. 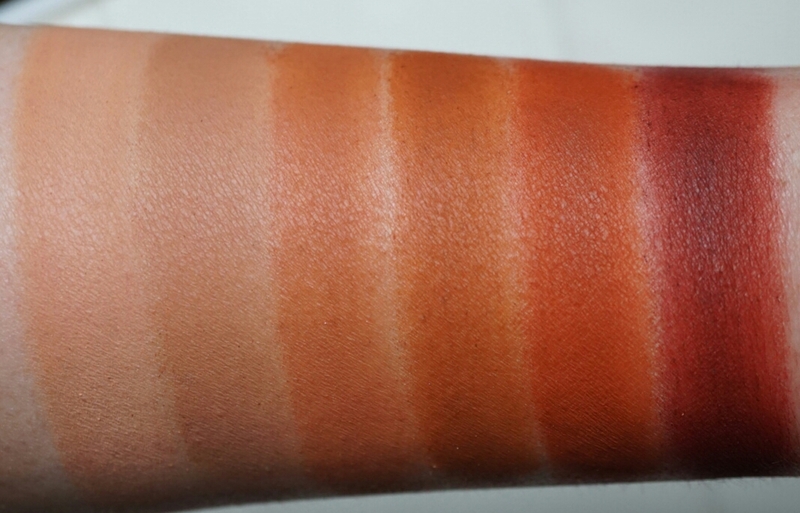 The color pay off is fantastic and the formula is creamy and smooth. This next column is all matte. ERIKA is light peach. ABIGAIL is a light warm taupe. KAITLYN is a light burnt orange. ALICE is also a burnt orange, a shade or two darker than KAITLYN. RILEY is a medium terracotta. SARAH is medium warm brown with orange undertones. The only color in this column that was slightly patchy was SARAH but to be honest, I think my brush was still a little damp. 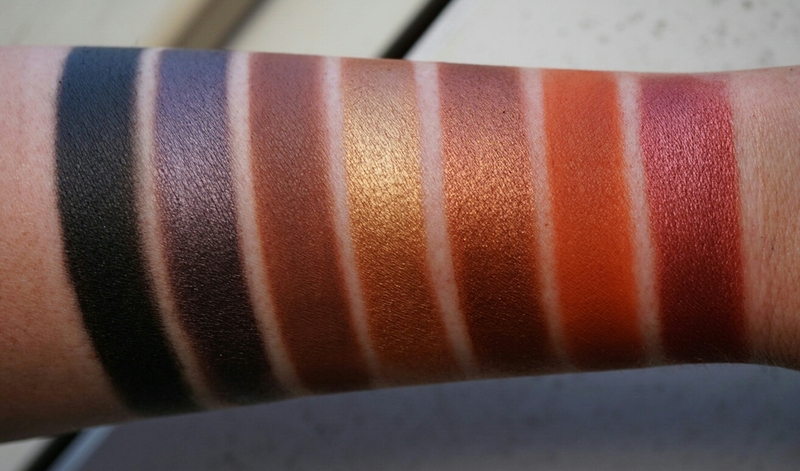 Besides that these mattes were pretty fantastic. Definitely superior to their original HG palette, in my opinion. I’m almost 100% sure that they’ve reformulated their shadows since then. ANN has a white base with blue violet reflects. 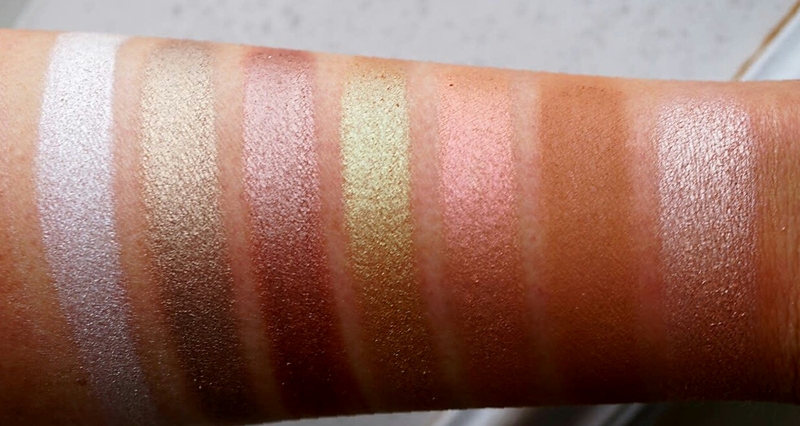 EMMA has a yellow beige base with strong pink reflects, similar to Mac Motif. ALLISON is a bright peachy pink, similar to UD Fireball. MADELINE is peachy gold with a satin finish. 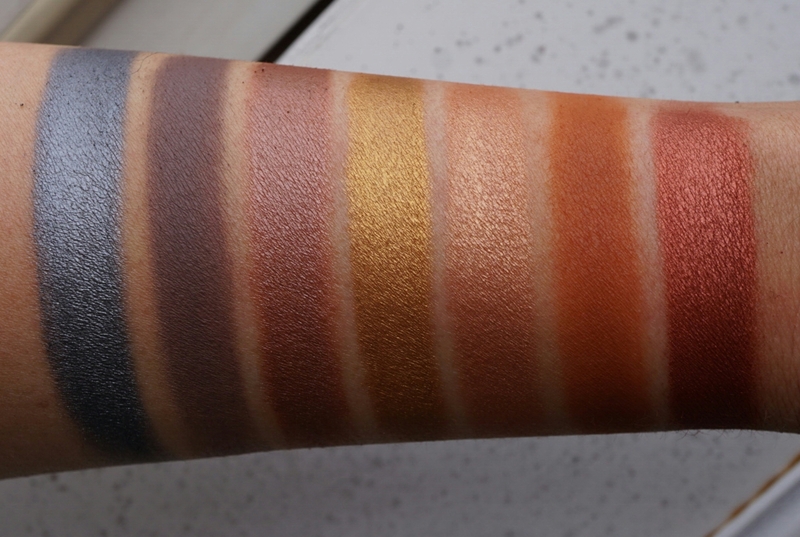 STEPHANIE is a dense foiled copper with gold glitter, similar to MUG Flamethrower. ASHLEY is a medium dark reddish brown with a matte finish. This column is all shades of gold. ELLA has a white base with yellow gold reflects. 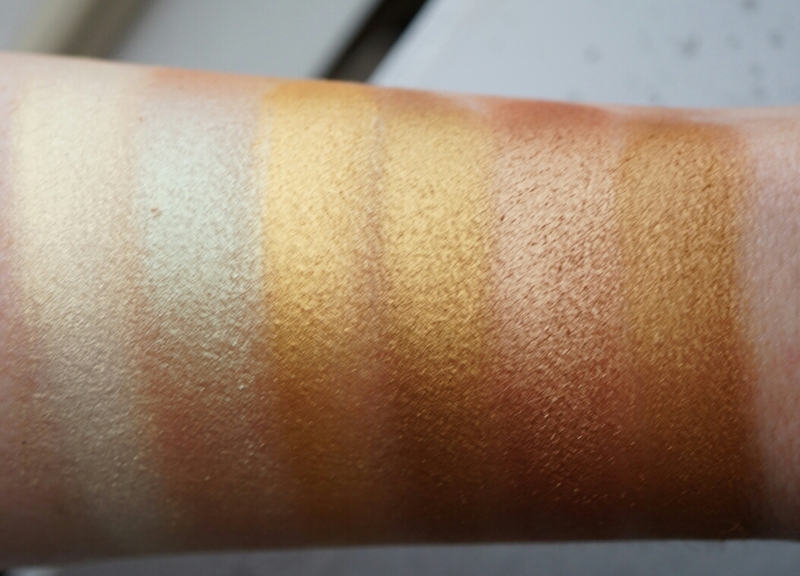 PAULA is a pale greenish gold with a light coppery shift, similar to UD Sideline. The next four are all brassy golds. JANE is the brightest. JESSICA has more ‘antiquey’ undertones. NANCY pulls slightly copper. DELILAH is the darkest and it has a satin finish. This next one is the ‘taupe column’ DESTINY is a taupey champagne. 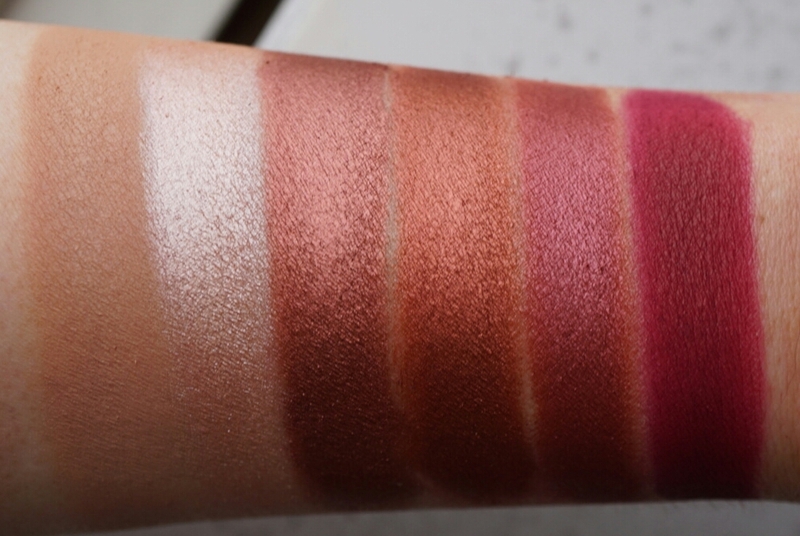 KELLY is a rosy taupe. NICOLE is medium taupe brown with a nearly matte, satin finish. MONICA is medium mauvey taupe. JOSIE and COURTNEY are similar matte browns. JOSIE has a neutral undertone and COURTNEY is more warm. And last but not least, we have our darker taupe and smoky gunmetal columns. APRIL is an off white matte. ALEX is a light silvery taupe. 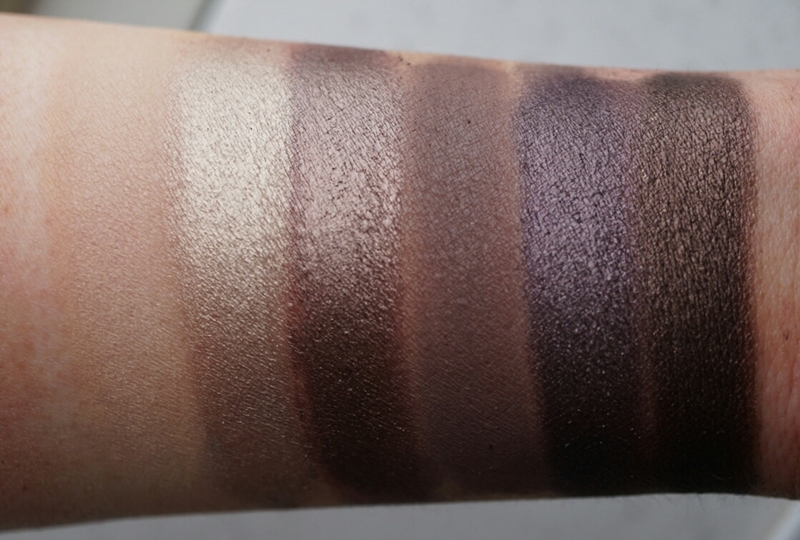 ARIEL is a darker metallic taupe with plum undertones, similar to Mac Satin Taupe. SKYLAR is a dark taupe matte. MARIA and RACHEL are both dark taupe metallics. MARIA has purple undertones and RACHEL has brown undertones. MICHELLE is a creamy white matte. FIONA is metallic pearl. JASMINE is a light silvery gunmetal. 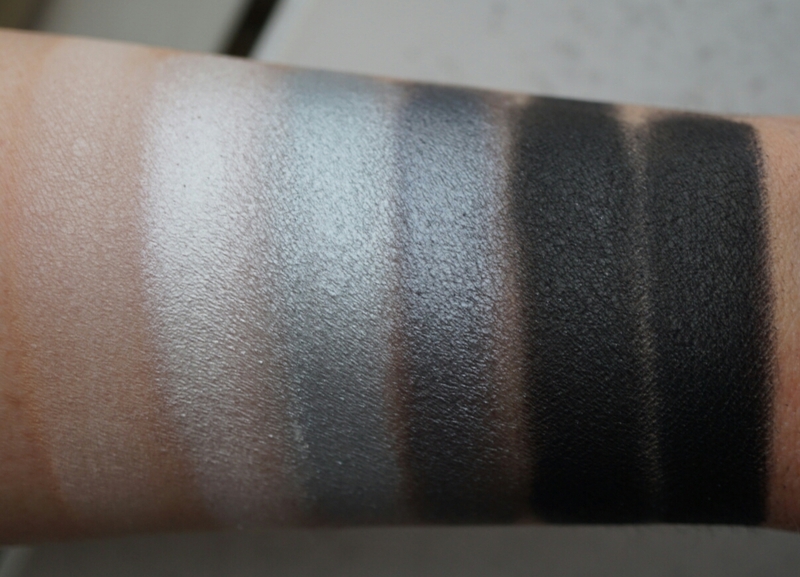 JAMIE is a medium gunmetal which blue undertones. NATALIE is a black with silver microglitter. The glitter doesn’t adhere to the skin but it allows the shadow to apply with the ease of a satin. CARLY is pure black matte that’s smooth and opaque. 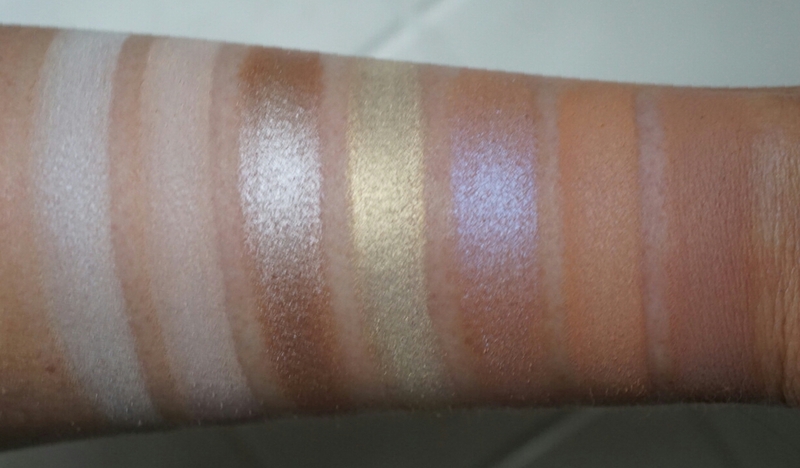 So to recap- I’m pretty impressed with this palette! 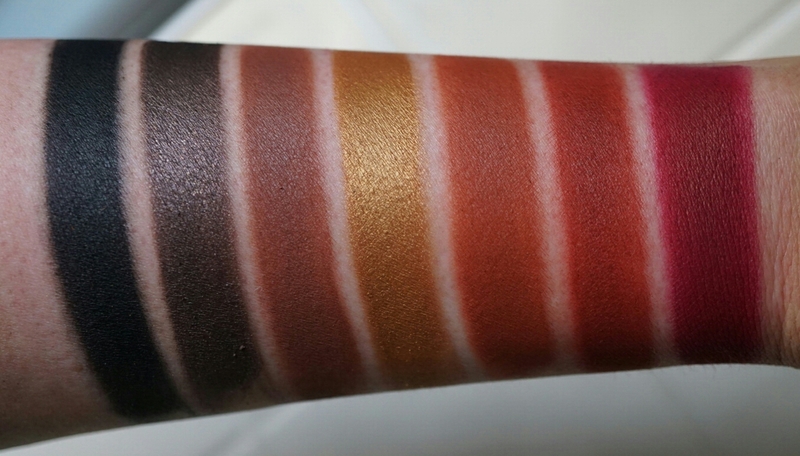 Every shade swatched nicely and wore well on the eyes. I think it was smart to choose shades within the same few color families. I also like the mix of finishes that they included. As I mentioned previously this palette is pretty expensive but when you consider the amount of product that you’re getting (it works out to less than $2 per shadow and they’re full sized), I think it’s a pretty good deal. 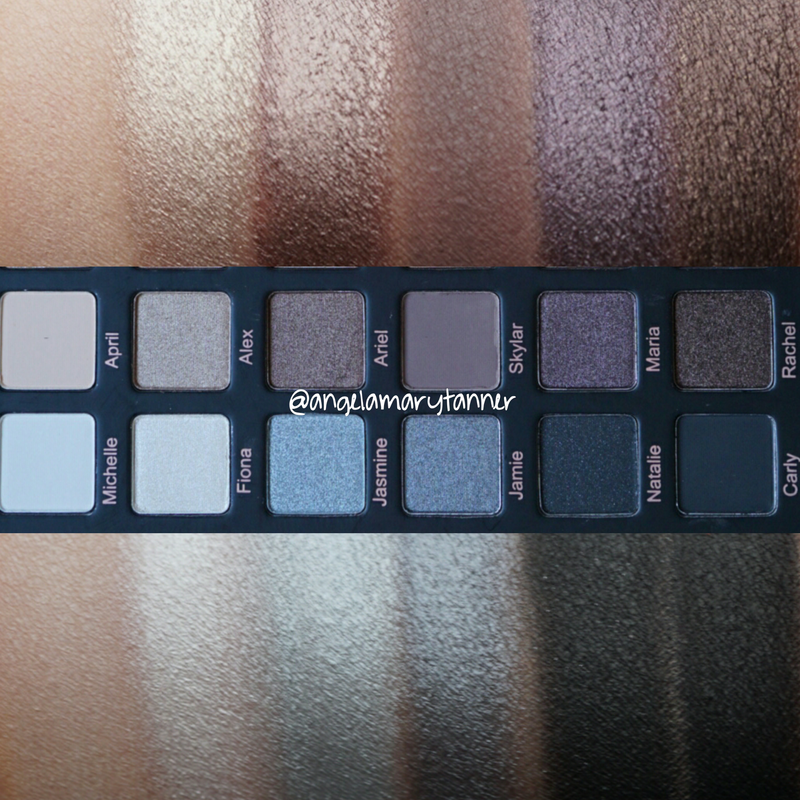 If these are colors that you’ll use and enjoy then I’d absolutely recommend this palette. It would also be a fantastic gift for someone who’s just getting into makeup. A palette like this could serve a girl very well for years. However if you have an extensive collection then there’s probably nothing here than you haven’t seen before. In the next few weeks, I’ll be giving one of these palettes away on my Instagram (@angelamarytanner) so make sure to follow me there, if you’re not already!